Before there can be any space exploration, there must first be an ability to reach low Earth orbit (LEO) from Earth's surface. The required speed for low Earth orbit is given in Table 3.1. For all practical purposes 100 nautical mile and 200 kilometer orbital altitudes are equivalent. Whether it is an expendable launcher or a sustained-use, long-life launcher, the launcher must reach the same orbital speed to achieve LEO. From here the spacecraft can move to a higher orbit, change orbital planes or do both. Reaching LEO is a crucial step because, as indicated in Figures 2.5, the current system of launchers is representative of the Conestoga wagons that moved pioneers in the United States in just one direction: west. There is no record of any wagon returning to the east. The cost of traveling west was not reduced until the railroad transportation system was established that could (1) operate with a payload in both directions, and (2) operate frequently on a scheduled basis. Both directions are key to establishing commercial businesses that ship merchandise west to be purchased by western residents, and raw materials and products east to be purchased by eastern residents. The one-way Conestoga wagons could never have established a commercial flow of goods. Table 3.1. Low Earth orbital altitudes and speeds. 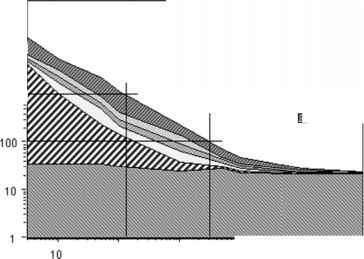 Figure 3.1. Comparison of payload costs to orbit, from 1971 to 2003.
presented an interview with the former NASA Administrator, Sean O'Keefe, that stated the projected cost for the five Space Shuttle launches per year is $US 3.2 billion. That reduces to about $US 29,000 per pound of payload delivered to LEO; for some missions that cost could rise to $US 36,000 per pound. The article stated that an additional flight manifest will cost between 80 and 100 million $US per flight. If the Shuttle fleet could sustain 10 flights per year, the payload cost would reduce to $US 16,820 per pound. If the flight rate were two a month, the cost would be $US 9,690 per pound. It is really the flight rate that determines payload costs. 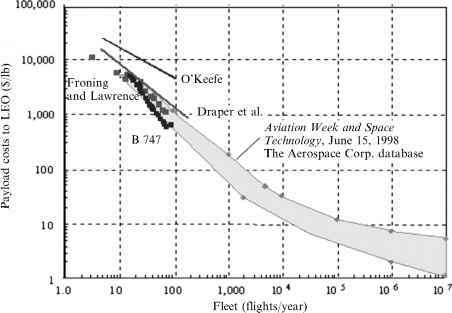 Figure 3.1 shows that the historical estimates of payload cost per pound delivered to orbit were correctly estimated and known to be a strong function of fleet flight rate for over 40 years. In the same figure there are five estimates shown covering the time period from 1970 to Sean O'Keefe's data in 2002. In the AIAA Aeronautics & Astronautics article in 1971 [Draper et al., 1971] the projected total costs for a 15-year operating period were given as a function of the number of vehicles. The payload costs were determined with the information provided in the article. This is shown as the solid line marked Draper et al. One of the students in the author's aerospace engineering design class obtained the cost of crew, maintenance and storage for 1 year of operation of a B-747 from a major airline. The student used that data to establish for a Boeing 747 operations cost in maintenance, fuel, and personnel for 1-year operation of three aircraft with one in 1-year maintenance. The annual costs are fixed, as they would be for a government operation; then, assuming that same B-747 operating with Shuttle payload weights and flight frequency yields a result shown in Figure 3.1 as the line of black squares marked B 747. These results show an infrequently used B-747 fleet is as costly as the Space Shuttle. Figure 3.2. Payload costs per pound based on fleet flight rate, after Penn and Lindley. kerosene) does not become the primary cost until fleet flight rates in excess of 10,000 flights per year are achieved. This and larger fleet flight rates are achieved by commercial airlines, but are probably impractical in the foreseeable future for space operations. From the MOL requirements given in Chapter 1, near-future fleet flight rates will be in the hundreds per year, not hundreds of thousands. 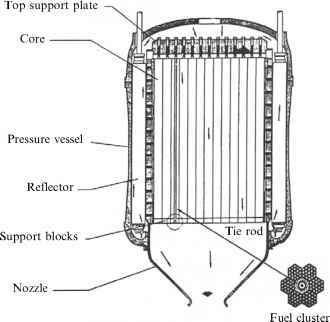 NASA goals of US$1,000 per pound can be met if the fleet launch rate is about 130 per year, or 2.5 launchers per week. For a fleet of seven operational aircraft, that amounts to about 21 launches per year per launcher, assuming an availability rate of 88%. That is about one flight every two weeks for an individual aircraft. At this point the five non-propellant costs are about 30 times greater than the propellant costs. For the NASA goal of US$l00 per pound to LEO requires about a 3,000 fleet flight rate and a larger fleet. Given 52 weeks and a fleet of 33 launchers with an 88% availability rate, the weekly flight rate is 58 launches per week, yielding a fleet flight rate of 3,016 flights per year. Such a fly rate demands an average of 8.3 flights per day! At this point the five non-propellant costs are about three times greater than the propellant costs. That is in the realm of the projected space infrastructure shown in Figure 2.23. Commercial aircraft exceed 1 million flights per year for the aircraft fleet, and that is why the cost for commercial aircraft passengers is primarily determined by fuel cost, not by individual aircraft cost. So, whatever the future launcher system, for the space infrastructure envisioned by Dr William Gaubatz in Figure 2.23 to ever exist, the payload cost to LEO must be low enough and the launch rate high enough to permit that infrastructure to be built.